P O Box 4066, Mulgrave, VIC 3170, Australia. 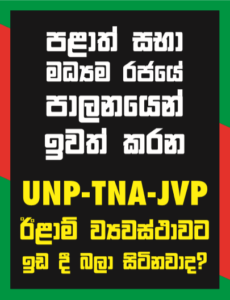 The ‘Island’ newspaper article of 10 March 2017 entitled “UNP makes light of UPFA question on Tamil Diaspora using internet to spread racism” has reported that Prime Minister Ranil Wickremasinghe stated in parliament that “a group of Joint Opposition (JO) members had joined hands with LTTE cadres to stage a protest against him while he was in Australia when Deakin University conferred an honorary degree on him” and that “the JO activists and LTTE extremists had protested against him and they were together shouting at him using public address systems”. The article also stated that the PM claimed that “Because when I was in Australia some 20 persons, supporters of the Joint Opposition and the LTTE protested while I was coming from Deakin University. So, there are occasions these two groups work together”. Protect the Unitary status of Sri Lanka and Reject the ‘Federalist’ Constitutional changes that have been proposed to appease Tamil separatist and foreign powers by weakening the Central Government and granting extensive powers to ethnically demarcated provinces. Review and Change the proposed Economic and Technical Co-operation Agreement (ETCA) with India such that Sri Lankan workers and investments are protected. Stop the sale of Sri Lanka’s assets and resources to foreigners. End the witch hunt of Sri Lankan war heroes and the persecution of intelligence officials. End the harassment of political opponents and the manipulation of democracy and the judiciary through political intervention. Stop protecting the disgraced former Central Bank Governor Arjuna Mahendran and the others responsible for the biggest robbery of public funds in Sri Lankan history through the bond scam. End the harassment of media personnel. At no stage did our demonstration or banners refer to an award made to Mr Wickremasinghe by Deakin University, but they did highlight his past record of appeasing Tamil separatist forces. We also wish to point out that, at a completely different location, a handful of people carrying an LTTE flag made a token protest against Mr Wickremasinghe who is seen by many Tamil separatists as their natural ally. There is a strong suspicion that some of his supporters may have connived with this group to cause confusion among the media and public in order to dilute the impact of the main protest. Given the above facts, Mr Wickremasinghe must explain to his parliamentary colleagues, the media and the people of Sri Lanka as to why his unsubstantiated statement differs so much from reality. Society for Peace, Unity and Human Rights in Sri Lanka -VIC Inc.
Surakimu Lanka Melbourne Ekamuthuwa Inc.
Ps. We also send herewith few photographs of the demonstration which questions the basic IQ of the Prime Minister.